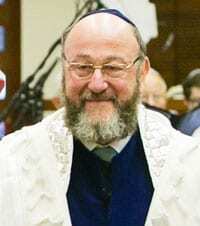 Rabbi Efraim Mirvis is the Chief Rabbi of the United Hebrew Congregations of the Commonwealth. He sends his Rosh Hashanah message to the Australian and New Zealand Jewish communities. In Jewish tradition, the names we give to places and concepts invariably capture the essence of what they represent. Our central congregational location for prayer is no exception. Located at the heart of our communities, it has three well-known names: beit tefillah, beit knesset and shul. Firstly, beit tefillah or ‘house of prayer’. This title was given by God to the Temple in Jerusalem and continues to be a most apposite term used to this day. It expresses the building’s core purpose of providing a place through which we connect with our Creator and experience His presence in a spiritually rewarding way. Through our synagogues facing Jerusalem, we also recognise the centrality of Israel in our lives. Another name is beit knesset or ‘house of gathering’. In vogue since ancient times, beit knesset adds a significant dimension to the role of our synagogues. Indeed, the Greek word synagogue similarly means ‘house of gathering’. The connotation is clear: our synagogues, especially in the Diaspora, are the central focal points for Jewish social and cultural interaction for individuals of all ages and groups of all types. Not only do we enjoy an encounter with God within its walls; we also engage socially with friends and acquaintances. The weekly kiddush epitomises the beit knesset, providing an opportunity for us to connect with others in a warm and welcoming atmosphere. It is encounters of this nature that weave the social fabric of our communities. The colloquial name for our synagogues – shul – is taken from the German word meaning ‘school’. Historically, the local school was housed within the synagogue building. In this spirit, many shuls today have a kindergarten and run a cheder for children on their premises. The word ‘shul’ adds a further imperative for our communal vision. Formal and informal education, for members of all ages and all backgrounds, must be at the heart of our shared communal experiences. In seeking to guarantee the on-going vitality of our congregations, we recognise that an in-depth awareness of our rich heritage will pave the way for a meaningful and fulfilling Jewish life in the future. It is my hope and prayer that all our community centres live up to the three names we give them, becoming outstanding houses of prayer, houses of gathering and synagogues rolled into one. Providing a combined location for communal spirituality, a meeting place for communal interaction and a home for communal learning will ensure we have vibrant and dynamic centres of Jewish activity. Building on the successes of the past we will transform our synagogues into powerhouses of Jewish religious, social, cultural and educational activity. Valerie and I extend to you all our very best wishes for a happy, healthy, peaceful and fulfilling New Year. I look forward to working together with you to develop and grow our local congregations and our wonderful British & Commonwealth Jewish communities for the benefit of us all and all of Am Yisrael.